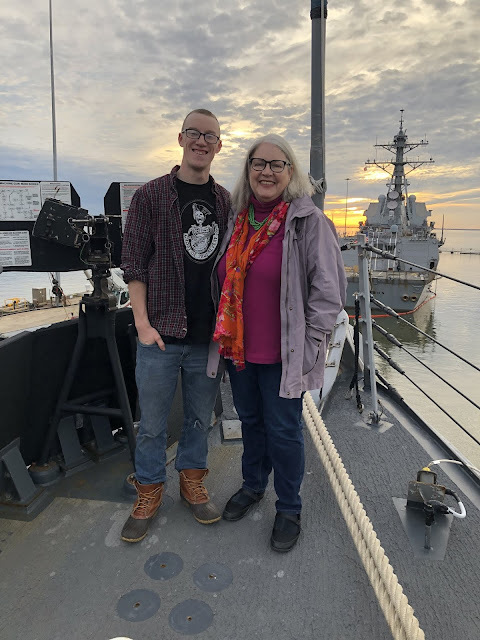 Julia Spencer-Fleming: So a little over two weeks ago, I made a trip to Norfolk, Virginia, to do something I've never done before - see my son off on his first deployment. 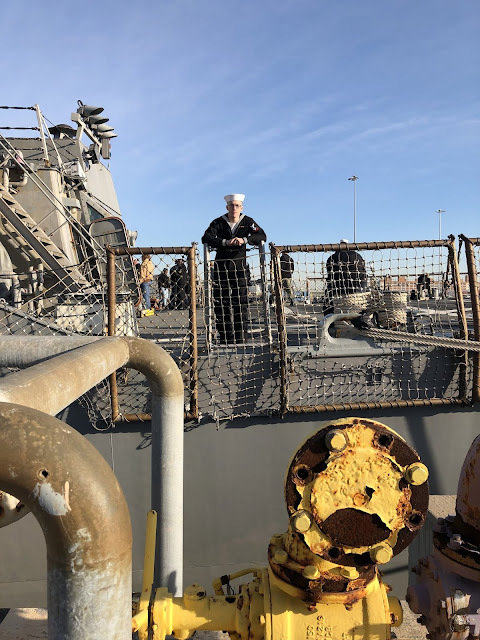 Petty Officer Spencer Hugo-Vidal - known here as The Sailor - and some three hundred shipmates are off as part of the US 5th Fleet operations in the Mediterranean, the Atlantic, the Arabian Sea and the Persian Gulf. 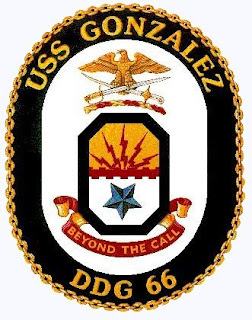 The USS Gonzalez is an Arleigh Burke-class destroyer, and like all destroyers in the US Navy, is named after a Medal of Honor recipient - in this case, Marine Corps Sgt. Alfredo "Freddy" Gonzalez, who displayed unbelievable courage in the Battle of Huế and lost his life after saving his entire platoon. Two days before the Gonzalez shipped off, Spencer's lovely girlfriend Veronique Pretlow - who also took these gorgeous pictures - and I got to tour the ship! It was amazing how MUCH the Navy manages to fit in these ships. Crew can spread out a bit in the mess, but most of the doors, passageways and ladders are built with slim people no taller than 5'10" in mind. Luckily for Spencer, that describes him perfectly. Since the US Navy isn't keen on civilians snapping a lot of pictures of the interiors of their ships, I only have one shot from inside: the Gonzalez's name plate. Why did I want this? 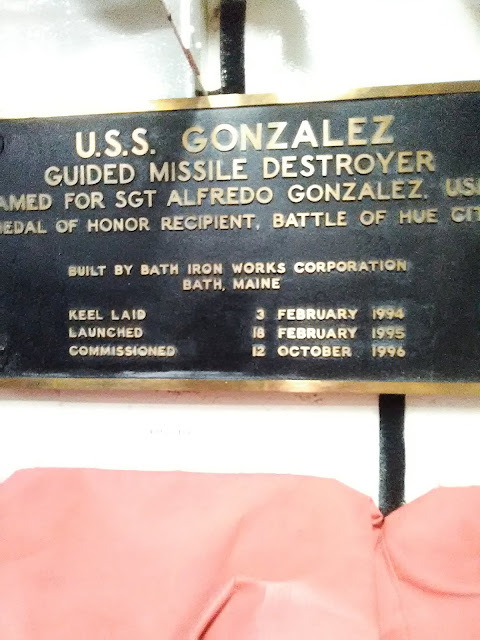 Because the keel was laid down the day my son was born, both of them on the coast of Maine, only 36 miles apart. I took Spencer and Veronique out to dinner - we did BBQ both nights. One thing the Tidewater VA area has lots of is fabulous BBQ. Here's my boy with his VERY regulation haircut. When I was a kid, we called these "Baldy sours." And then it was the morning of their departure! Spencer and Veronique picked me up from my hotel at 0700. It was a beautiful morning, as promised (if you believe the old rhyme) by the red sky the night before. 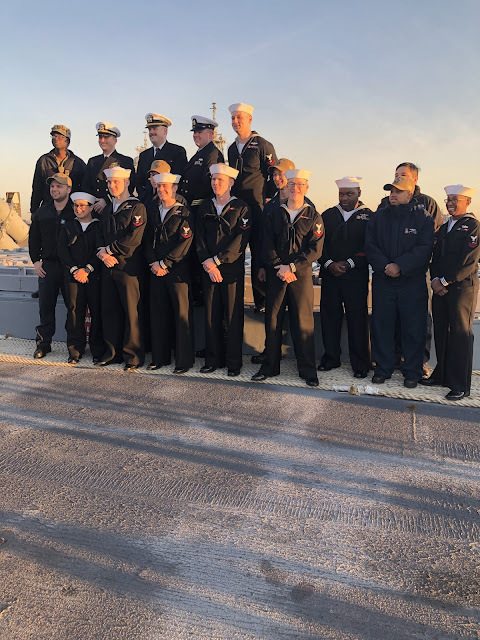 The ship was buzzing - friends and family were everywhere, sailors were showing them around, and at the same time, working on the complicated process of getting an 8,315 ton, 505 foot long vessel underway. We got to take part in an on-deck briefing for the Internal Communications Electricians and meet the Chiefs and Master Chief. Here's a picture of the whole team. And Spencer watched us as from the quarterdeck as we walked along the pier. 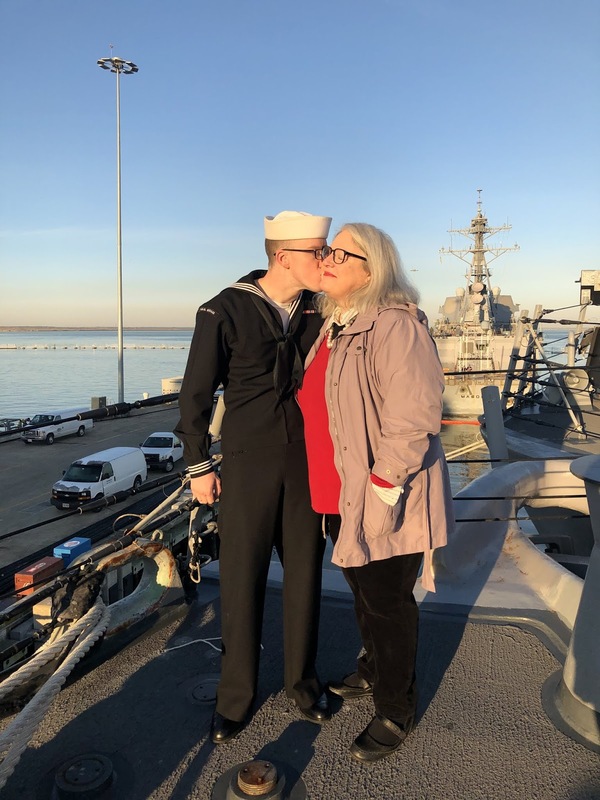 Have a safe cruise, Sailor! Anchors aweigh! You must be so proud! Thank you to your son and his crew for their service. Thanks, Marla. I am very proud. Spencer looks so handsome in his sailor uniform. I'm sure you are button-popping proud of him. I have so much respect for and gratitude to those serving in our armed forces. The photos you've posted are great, Julia. Congratulations! You and Ross did a wonderful job of raising a fine young man. Such wonderful photographs; I’m sure you are a proud mom! We’ve gone down to Norfolk when the ship was returning to port from deployment, and that’s quite an experience, too. 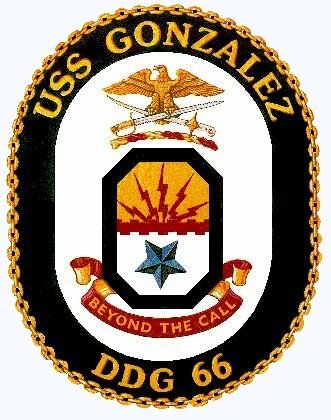 Thanks to Spencer [and his shipmates] for their service . . . . I'm already planning to be there in October (if his cruise doesn't get extended) to see the ship coming in with the crew manning the rails. Everyone says it's a moving experience. There’s always a huge crowd, but it’s definitely a trip worth taking . . . seeing the ship come in to port is truly awesome. There's just something about a man in uniform! But also, sniff. How long will he be gone for? Is he likely to run into conflict? Those things must concern a mom - they would me, I know. Blessings on the Sailor and his shipmates. Seven months, Edith (if the cruise doesn't get extended, which sometimes happens.) They'll be in the Persian Gulf, so... no one serving is entirely out of danger, but I figure with the Navy, at least you're twenty miles offshore when things start heating up in an given country! Omigosh. 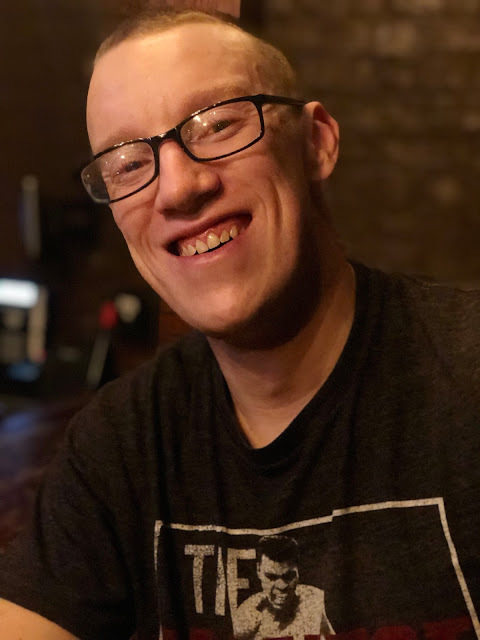 Spencer looks so much like Ross, but without all the hair! And at the same time, he has your lovely smile, Julia. I admit to getting the shivers about him and the Gonzalez both coming into being on the same day. Safe seas and fair winds, Spencer. He does look more and more like his dad as he gets older. He had such thick, curly hair as a child...sigh. I thought the same thing, that he looks so much like your dear Ross. Julia, we keep a list of people serving in the military on our prayer list at church. It is posted in the bulletin every Sunday. Would it be all right with you if I put Spencer's name on it? It would stay there as long as you want it to. Mary, I would be grateful. I pray for his safety every day, and am happy to have others doing so as well! One of my favorite hymns! Finta, we had that as the closing hymn at Ross's funeral. I still get a BIG lump in my throat when I try to sing it. Good for him. Hard for the family. I grew up in the Navy. Not easy for the family. We did end up in Norfolk /Virginia Beach where I went to high school and college. Fair winds and following seas to the crew. Thanks, Pam. It's not exactly easy for me, but I grew up in the Air Force and Army, and my husband (as well as all my uncles) served. So it's at least something I'm well familiar with. Oh Julia, I adore those pictures! you must have been bursting with pride and heartbreak. Safe voyage sailors, and thanks for your service. Wow! What an experience! You must be so proud of him. Hope he returns safely. Oh my goodness, I am crying! I love that you were resolutely smiling, I know you must be so proud, but what an astonishingly once-in-a-lifetime moment . Oh, Julia, congratulations and much love and much joy. Than you, Hank! I'm a proud mom, it's true. What a wonderful opportunity for you! Great pictures of mother and son! How cool is that his being born the same day as the ship? That gave me shivers! Many years ago, when I was college I was traveling with my parents and we stopped in Norfolk to visit a former classmate of mine. It turned out that the next day was family cruise day and did we want to be John's family for the day. We certainly did and that has been one of the best experiences I ever had. I don't believe we went very far "out to sea" but you couldn't see land so that worked for me. I was so glad to get to explore the ship, Judi. They manage to be both marvels of engineering and logistics, and something you'd imagine seeing in crowded rooms in a hospital basement. The part I hadn't realized - no portholes at all! To see daylight, the crew needs to go on one of the weather decks. Julia, thank you for sharing these wonderful photos, and the personal story behind them. Will be keeping you and the Sailor in my prayers until his return. And to Spencer: Fair winds and following seas, Sailor! A mother's joy and sorrow all in one--proud, yes; worried, yes. Prayers for the Gonzalez and her crew--and for you, too, Julia, until Spencer is home again. Julia, thanks for sharing your special day with us. My pleasure, Dru Ann. I'm not one to carry lots of pictures of my kids on my phone - I prefer to show them off to the whole internet! You are so brave, and proud with good reason. Gish darn it, where's the giant heart emoji when you really need it? Thank you, Hallie. Oh Julia, my heart is overflowing for you. Spencer is a man and, at the same time, your boy! I'll keep you both in my prayers. Safe seas and fair winds to you you both. Thanks, Lyda. 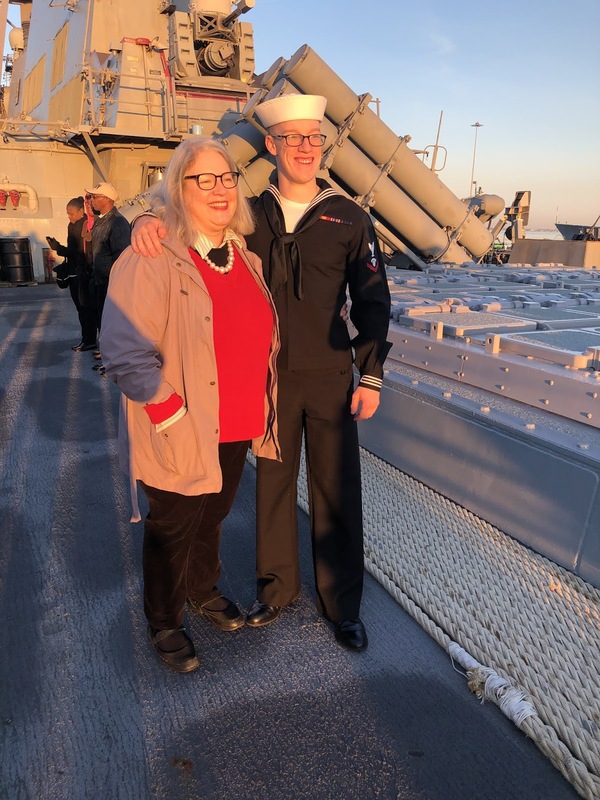 It is odd to see him with both lenses - he's a highly competent ICE rate, doing his part to defend our country, but at the same time, he's definitely still my goofy kid. We share your pride! Calm seas and prosperous voyage to Spencer and crew of the Gonzalez. Such wonderful photos! I got to go on an aircraft carrier once and it was an amazing experience but the best was visiting my husband's cousin who was a nuclear submariner in Groton. We were able to go on board and look around (with a lot of machines covered up). At 5' 2", I was fine but my 6' husband was crowded and knew he could not have stood it for an entire deployment. I admire all those Navy men so much. My brother--n-law was on a destroyer in Viet-Nam. We'll be following with our hearts. Thanks, Atlanta. When we were touring the Gonzalez, I asked Spencer, "What do the tall guys do?" He said, "Get a lot of trauma-induced headaches." Great photos! I can see the family resemblance. You must be so proud, Julia. Praying for a safe cruise for him. Thanks, Cathy. I don't see much of my looks in him, but he's lie a carbon copy of his father at the same age - albeit with less hair. When Ross was in the USAF in the 70s, they allowed a hair length that would be unbelievable today. He looks just like his dad, who must be so proud of Spencer! The history of the Gonzalez makes it seem like Spencer and the Gonzalez were always meant to be together. I thank Spencer and his shipmates, and I pray for all of them and for you, too, Julia. Wonderful post and pictures. Our son was in the Navy so it all sounded and looked very familiar. The idea of the "hot bunk" was a new one for me - ugh. Best of luck and prayer for safety for your boy. Thankfully, they don't hot bunk in the Gonzalez, Grandma. (I agree - ugh!) But the size of their bunks, stacked three atop - lets just say you have to be slim, short and impervious to claustrophobia to get a decent night's sleep! I remember when you told us that Spencer joined the Navy. Now he is an E 6. Well done, very well done. May all who serve be well, may all who wait with love be at peace. Thank you, Coralee, what a beautiful turn of phrase. Thanks for sharing. Joy, pride, and sadness. That is what I felt during my son's military career. All of those things, Pat, yes. You must be so proud, Julia! I am! And he's doing what he loves, so I love it, too. Sounds like you had an awesome time! But if you can, try to be there when the ship returns. One year while my husband was in the Naval Reserves he did his 2 week summer duty on an aircraft carrier at the end of its deployment. His Dad and I drove to Norfolk to meet it. It is the most amazing experience to be there when a ship comes in. They had a special tent for all the new moms and the new dads got to get off first to meet their new child. So many families had signs welcoming back their loved ones. Tears of joy and ear-to-ear smiles everywhere. Hubby was gone less than 3 weeks and I was emotional; I can’t imagine those families whose loved ones were gone for 6 months! What a wonderful post. 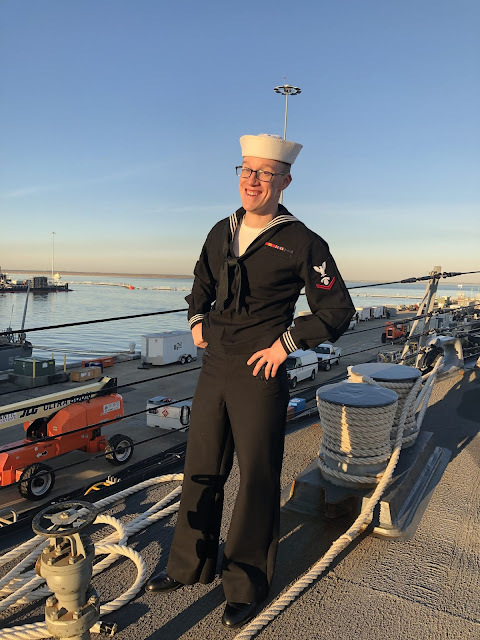 Godspeed, Sailor Spencer! And hugs, Julia. As proud as you must be, he's still your baby. You know what that's like, Jenn. Sometimes it's still like seeing a little boy standing in his dad's big grown-up shoes. Spencer has his father's smile, that is for sure. I'm happy to see these sweet photos of him smiling at you and kissing you goodbye. Will hold him in my heart while he's away. Thanks, Brenda. He does look so much like Ross as he gets older. It makes me smile. What a fine young man. That sweet, proud smile--he's off on such an amazing adventure, and here I am, thinking how young and tender he looks. It's good that the sailors feel ready for their journey after completing their training and making such an important, heartfelt commitment. Meanwhile, we moms and aunties and blog-friends can look at them and think, "oh, look at that open face!" while they head out into the big world. Imagine the stories he will bring home to you, the sisters, and Veronique. You capture the feeling perfectly, Beth!